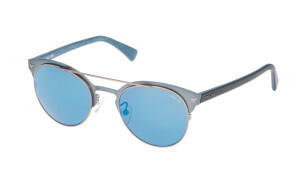 De Rigo Vision releases frames from Police, Carolina Herrera and Lanvin at Vision Expo West. POLICE, the world-famous lifestyle brand has 4 new frame releases. S8950-KTB: URBAN METAL VINTAGE– Bright colors give a cheerful quality to the round acetate in solid colors featuring the “clip-on” effect that recalls the Seventies, with distinctive details such as the metal bridge, ton-sur-ton temples and the iconic logo on the front piece. The model is designed for a woman who is in search of a retro-glamorous urban style. 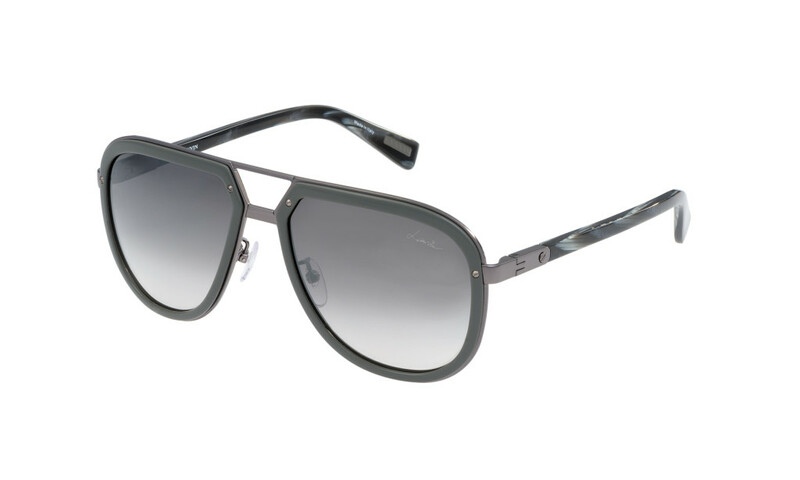 The thin temples are customized with the iconic Police logo. POLICE, the De Rigo Group’s house brand, was launched in Italy in 1983 as unisex eyewear and a metropolitan manifesto for those who set out to get noticed. The name is no coincidence. It triggers the imagination and dreams, especially of the younger generations, and offers a whole new outlook, across the ocean and against the tide. The name evokes the American “on the road” lifestyle, but also the strong urban spirit of the city of all cities: New York. The POLICE attitude made its worldwide mark right from the outset, as an Italian brand with potent international overtones. This alternative, nonconformist, almost irreverent brand immediately carved out a niche of its own. Building on its growing identity and positioning, over the years POLICE has reinvented itself, going from a simple eyewear brand to a veritable lifestyle benchmark. In this transformation, the brand extended to include a full range of fashion accessories – perfumes, watches, jewelry, and leather goods – all with a strong personality, and representing a particular look and way of life. Young, authentic rebels, who follow the trends but seek to stand out with originality and flair, are thus irresistibly drawn to the POLICE “community”. Police products are now distributed in more than 80 countries across all major cities. Since 2008, the brand’s retail strategy has focused mainly on the Middle East and China, alongside the opening of 40 shop-in-shops in the most important Department Stores. These shop-in-shops embody the quintessence of the POLICE lifestyle. They serve to reinforce the brand image and its metropolitan attitude whilst presenting a lifestyle as a whole. CH Carolina Herrera is the lifestyle sportswear collection of the global fashion house Carolina Herrera. It appeals to a broad customer base while maintaining the sophisticated and effortless style that is inherent in the signature brand. CH Carolina Herrera brings casual elegance to every aspect of one’s life, while offering a wide variety of ready to wear, accessories, fragrance and specialty items for women, men and children. Starting from 2011 CH Carolina Herrera line will be enriched by a new eyewear collection, feeling the real spirit of the Brand. The oldest French couture house, founded in 1889 by Jeanne Lanvin, is today a reference for the Parisian industry of luxury. An aficionado of culture, Jeanne Lanvin created a style and a global universe of elegance providing an outstanding cultural heritage. Since September 2001, the owners have successfully returned this major French name to its former prestige, by giving the artistic direction to Alber Elbaz who manages all the activities of the house with talent. The Jeanne Lanvin company is still headquartered at numbers 15 and 22 Faubourg Saint-Honoré in Paris, on a street that is world famous in the luxury industry. SLN044-568X: This style, which reinterprets the classic aviator model, perfectly combines the love for vintage shapes with the contemporary soul of the Maison. The structure is in metal and wood-effect acetate. The decoration that embellishes the temple is a classic example of how Lanvin masterly combines aesthetics with functionality. De Rigo Vision SpA is a world leader in the design, production and distribution of high-end eyewear and sunwear. De Rigo Vision controls the wholesale division of the De Rigo Group and manages a portfolio of brands, whether owned by the Group or used under licence, which fully covers the different sectors of high-end market segments. It is active in all the major markets of the world with its own brands Lozza, Police and Sting and with the licensed brands Blumarine, Carolina Herrera, Chopard, Escada, Fila, Furla, Lanvin, Loewe, MOMODESIGN, Nina Ricci, Orla Kiely, Tous, Trussardi, Zadig & Voltaire. Designed in Italy and in Japan, the Group’s products are distributed in about 80 countries of the world, especially in Europe, Asia and America, through 13 companies with 18 business divisions and over 100 independent distributors, for a total number of approximately 50 thousand customers. Since 1978, the year in which Ennio De Rigo laid the company’s foundations, eyewear production has carried on within the family business, in which dedication to traditional work and the masterly ability of automated processes are combined into new technologies, innovative materials and in the search for continuous inspirations and creations that have always distinguished the tradition of the Group.